Citizen goal was clear from the start: to have a watch made for everyone. Time telling involves looking at the hands position on the dial but because this is not always possible, a watch was needed for the visually impaired people, for those who are blind or don’t see that well, and for those who have no light during night hours. Maybe Citizen also thought about the military purpose when a light is not always possible to use, so a different solution was needed. This is just a rumor and I doubt it is true, but who knows?! Unfortunately the solution was not a minute repeater (I would have loved one!) 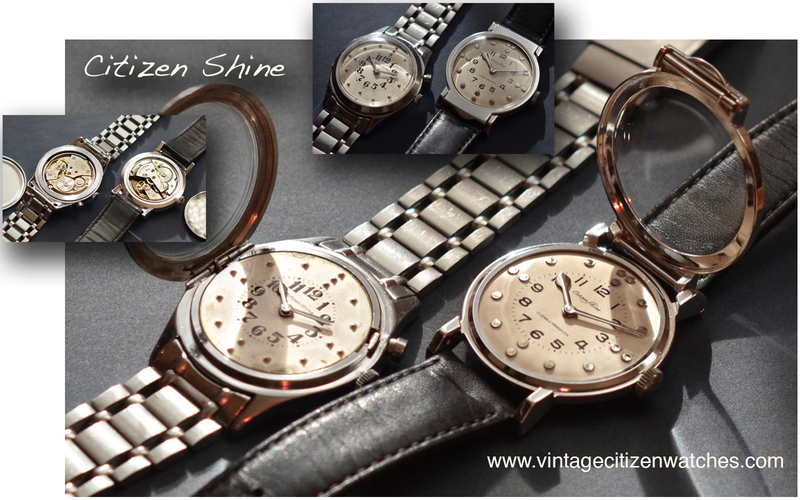 Citizen launched the “Shine” model in 1960. 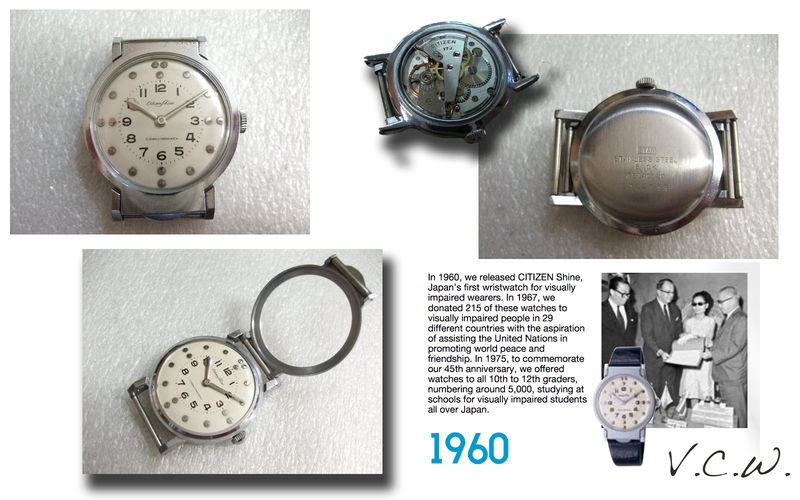 An official press release states that in 1967 a number of 215 watches were donated to 29 different countries to help the blinds, as an effort to support the United Nation program of promoting friendship and world peace. In 1975, 45 years after the first ever Citizen was produced, the company donated 5,000 of these watches to all 10th to 12th graders visually impaired students in Japan. Citizen Shine was the obvious answer for them! The name is somehow ironic because for an object to shine it needs light, but this model tells time without that. If it shines, it doesn’t shine for time telling! The case (35mm/10mm), as well as the bracelet, is made in stainless steel, (second generation has a SS back but the case is metal based) the flat caseback snaps into position and the domed acrylic crystal covers the face. If this would have been made only for the blinds I feel that having a clear crystal would have been somehow an overkill. So, what makes it so interesting? Well, the main feature is the fact that on this model the crystal is hinged to the case and can be flipped open. On the earlier variant (it was first introduced in 1960, making it the fist Japanese watch for the blinds) the crystal flips vertically pulling it open, but later on (on this first image 1969 example) a push release button was added at 2 o’clock so that the crystal pops open when that button is pressed. This makes it more secure and doesn’t open by accident, only by pressing that button. Now, on the later one, the hinge is on the lateral side of the case. Both variants do that in order to facilitate access to the dial and hand. The purpose for this is that the wearer can touch the face of the watch and this way the time is read. The hands are strong, polished and obviously very different in shape. The dial has three raised dots at 12, two at 3, 6 and 9 and one for the remaining hours. At the earlier model the dots were applied. Maybe they changed that because the applied dots fell as a result of all the touching and this could have affected time telling. Or maybe because it was cheaper and easier to manufacture this simpler second generation dial. There is no seconds hand to interfere with time reading. This way, only by touching, one can know what time it is. The calibre is a manual winding one, with 17 jewels. Update 2015 Oct. – I was lucky enough to find a NOS, first generation piece, made in 1960, the very first year of production, so here they are below, side by side. 🙂 As you can see the movements are different, the crystal part opens differently, the dials and the hands are also not the same. All things considered, this is an interesting watch, with a lot of history. We must not forget how lucky we are and blessed with our health. Also helping others less fortunate should be something for all of us to consider when possible! Read more about Citizen history HERE. 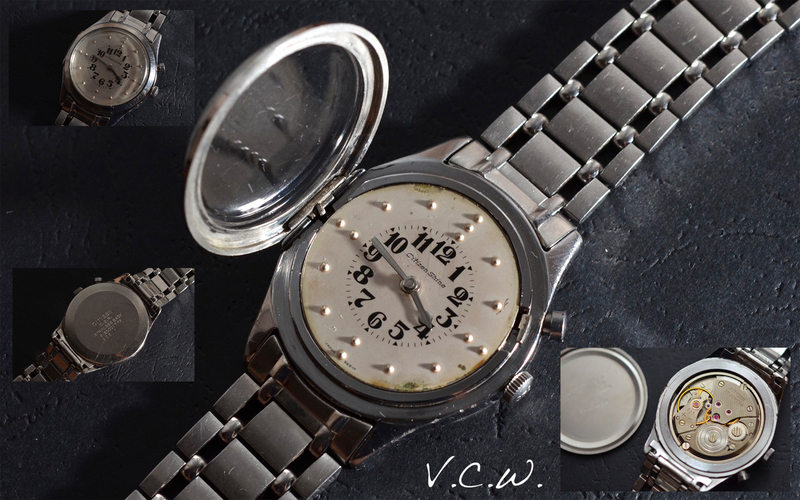 This entry was posted in hand winding, vintage Citizen and tagged 4-300017TA, braile citizen shine, braile watch, braille citizen, braille watch, citizen CSP, citizen for the blinds, citizen shine, citizen shine csp, citizen shine watch, vintage citizen shine, watch for the blinds. Bookmark the permalink.